Long before climate change and sustainability were part of the American consciousness, Thomas Graedel was conducting pioneering research in these fields. For his contributions to the understanding of atmospheric chemistry and his work to develop the field of industrial ecology, Graedel, professor emeritus and a senior research scientist at Yale University, will receive the 2019 Regents’ Distinguished Alumnus Award, Washington State University’s highest alumni honor. A reception and award presentation will be held starting 3:30 p.m. Tuesday, April 2, in the Lewis Alumni Centre on the Pullman campus. Graedel will also give a seminar at 4 p.m. Monday, April 1, in Spark G45. Both events will also be available via videostream. Originally from Portland, Oregon, Graedel received his B.S. in chemical engineering from WSU in 1960. He went on to receive a master’s degree in physics from Kent State University and a doctorate in astronomy from the University of Michigan in 1969. Upon graduation, he went to work for AT&T Bell Laboratories in New Jersey as a member of the technical staff. He later joined the faculty at Yale in 1997 as a professor of Industrial Ecology. His research career has been widely varied, including conducting research in solar physics; chemical kinetic modeling of gases and droplets in Earth’s atmosphere; corrosion of materials by atmospheric species; atmospheric change; and industrial ecology and sustainability science. He is an author or co‑author of 18 books and nearly 400 technical papers. His work has been cited more than 25,000 times. During his time at Bell Laboratories, he first became interested in industrial ecology. Several researchers were trying to ensure that the Bell system was meeting new environmental regulations and realized that in an industry that used a lot of energy and materials, they could find effective ways to increase manufacturing efficiency and minimize impacts, and doing so in a more sustainable manner. Graedel and a few colleagues, both at Bell Laboratories and in other industrial laboratories, began developing the field of industrial ecology, in which one aims to design processes and manufacture products in such a way as to minimize materials use, energy consumption, and environmental impacts. Interest in their work grew. In 1995, he and a colleague, Brad Allenby, published a textbook on their work, Industrial Ecology. Later he published another textbook, Industrial Ecology and Sustainable Engineering, in 2010. In their text, the researchers discuss how materials and energy are used, what gets re‑used, and what gets lost. Then they explained industrial product and process design to minimize impacts and promote recycling and re‑use. In particular, Graedel developed a simple matrix that improved the existing methods of life‑cycle analysis. Their work has become standard practice in industry. For his contributions to environmental sciences and “the new discipline of industrial ecology,’’ he was elected a Fellow of the American Association for the Advancement of Science in 1998. For his pioneering research and outstanding contributions to the engineering theory and practice of industrial ecology, he was named a member of the prestigious National Academy of Engineering in 2002. Graedel also did pioneering work in atmospheric chemistry. He and colleagues at Bell Labs were the first to warn of urban methane and carbon monoxide increases in the late 1970’s. Both gases are now understood to be significant contributors to global warming. Along with Nobel Laureate atmospheric chemist Paul Crutzen, Graedel wrote Atmosphere, Climate, and Change, published in 1994. The authors received the American Meteorological Society’s Louis J. Battan Author’s Award for their work in 1995. 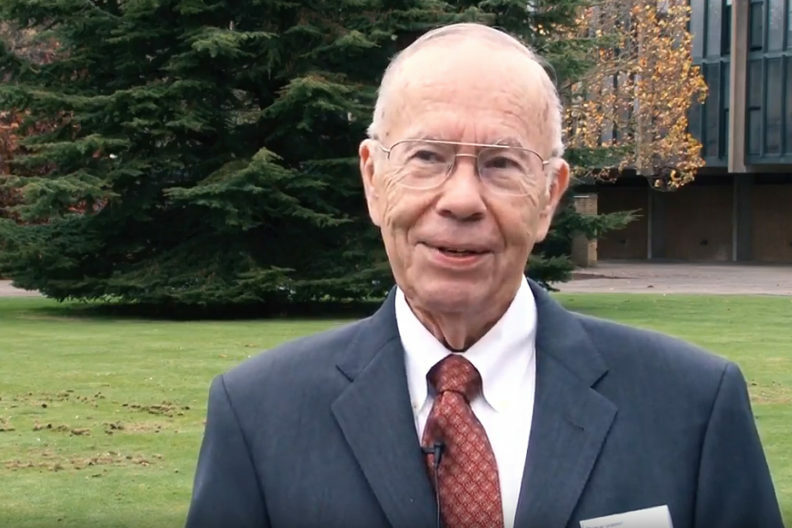 Since 1962, the Regents’ Distinguished Alumnus Award has been given to alumni who have made significant contributions to society and, through their accomplishments, have brought attention to the quality of a WSU education. Previous winners include broadcaster Edward R. Murrow, author Sherman Alexie, Microsoft co‑founder Paul Allen, cartoonist Gary Larson, astronaut John Fabian, sports broadcaster Keith Jackson and Schweitzer Engineering Labs founder Edmund O. Schweitzer III. Graedel is the 50th recipient of the award. For more about the award, see the WSU Regents website. Nominate someone for the award.